I haven’t made these yet so I can’t attest to how good they taste but they’re on the menu for sooner than later. I’ll probably play with the recipe to find an easier way to do the beet. Still, when I saw the pic and read the ingredients, I was all…YUM! Let me know if you give them a try before I do. Combine thyme, sugar, celery seed, garlic, and bay leaf and sprinkle over roast in slow-cooker. Pour soy sauce over roast. Cook for 4-5 hours on high, or 7-8 hours on low setting. Meat is done when tender and shreds easily. Remove meat from slow-cooker and shred. Cut dinner rolls in half and lay bottom half of each one on a baking sheet close together. You want the sides of each roll to be touching. 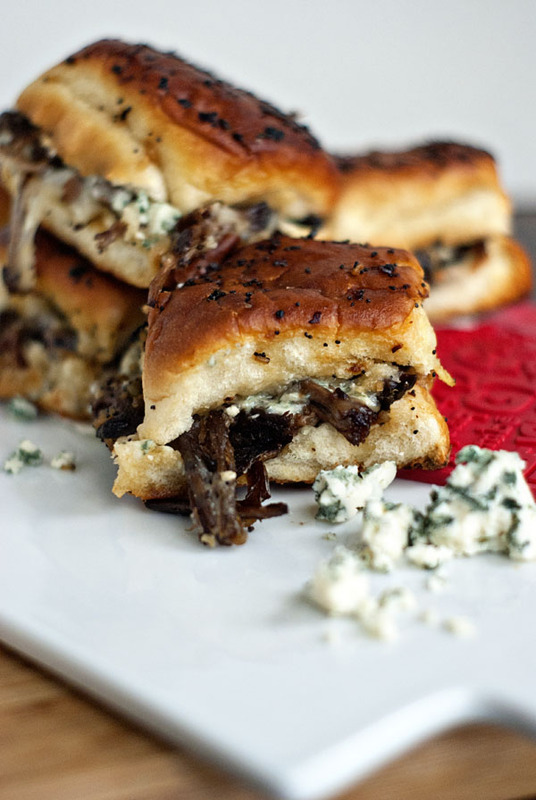 Place a portion of shredded beef on top of each roll followed by the mozzarella and blue cheeses. Combine the mayonnaise with horseradish and pepper, stir to combine and then spread on the bottom side of the top half of each roll. Place the roll tops on the cheese and beef to create a sandwich. Melt the butter and combine Worcestershire sauce, poppy seeds, onion, and sugar. Pour butter mixture evenly over the rolls. Cover baking sheet with foil and bake in a preheated oven at 375 for 10 minutes. Uncover and continue to cook for an additional 5-10 minutes or until the cheese is melted and tops are browned. To check the site where I found this recipe and to read all the details, CLICK HERE. This entry was posted in Writing Life and tagged food, links, recipe, Tuesday Treats. Bookmark the permalink.